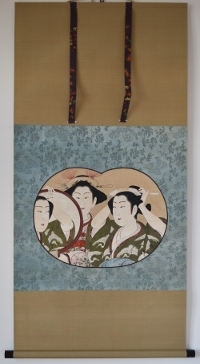 A sumptuously clothed beauty designed for the Shippo Club. 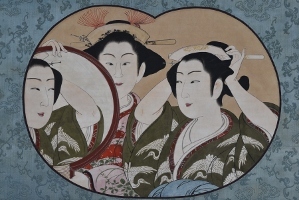 The surimono is unusual in having a caramel-coloured background. 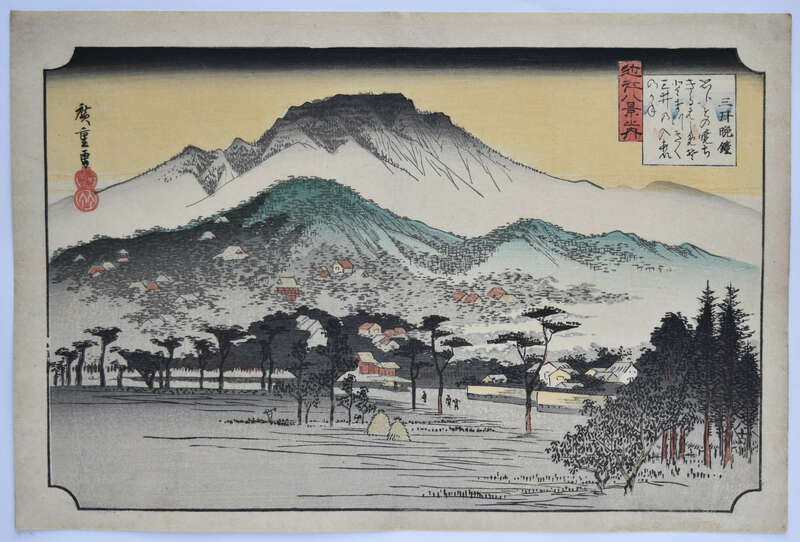 Fine impression, colour and condition. 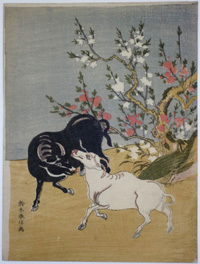 Signed Gakutei with seal Shima. 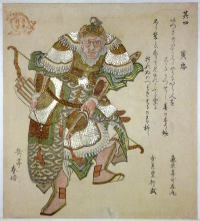 A surimono showing the Chinese warrior Huang Zhong ( Jap: Ko Chu, d. 220 AD ). 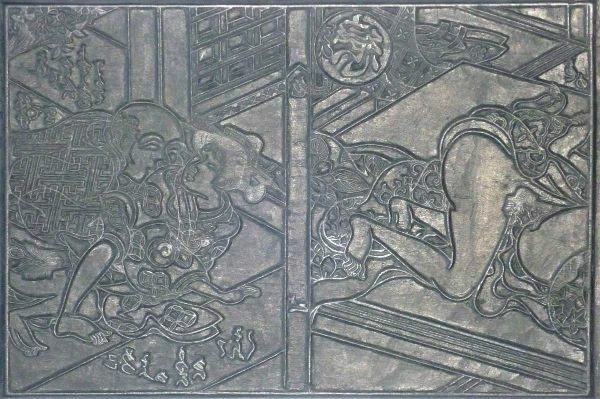 Best known for his role in the novel Tale of the Three Kingdoms. He is shown wearing tiger skin breeches and armed with a large sword, bow and arrows. 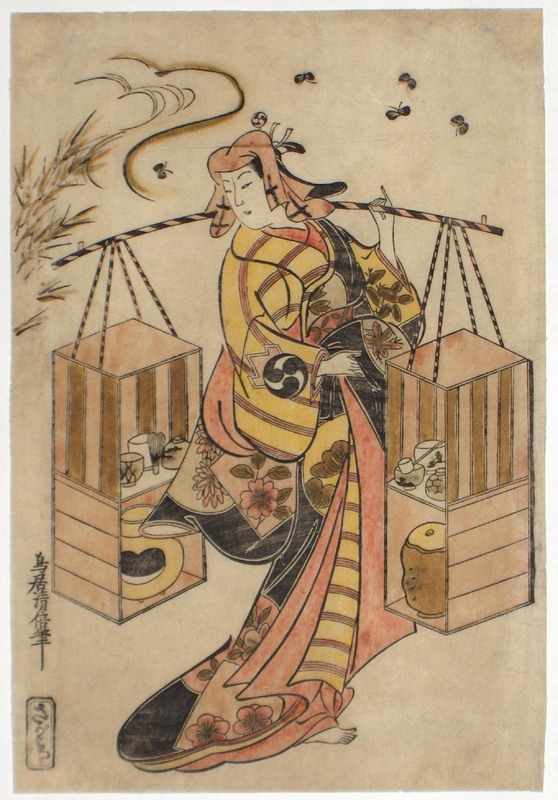 From a set Go koshogun, “The Five Tiger Generals.” Title on right Sono yon Ko Chu, “Nr 4 Huang Zhong. “ Issued by the Asakusagawa Poetry Club ( seal top left ) for the Tiger year 1818. 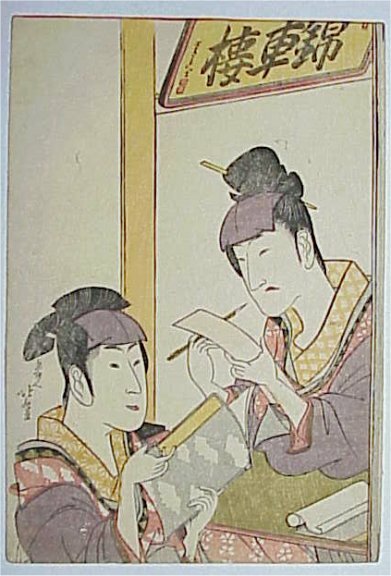 Two poems by Shinsokutei Kashimaru ( right ) and Hogetsudo Yukitake ( left ). 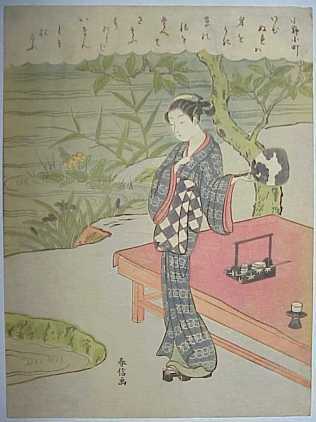 Fine impression. Very good colour with extensive gold and silver. Very good condition. 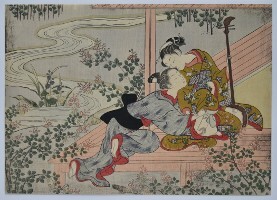 Signed Gakutei Harunobu. 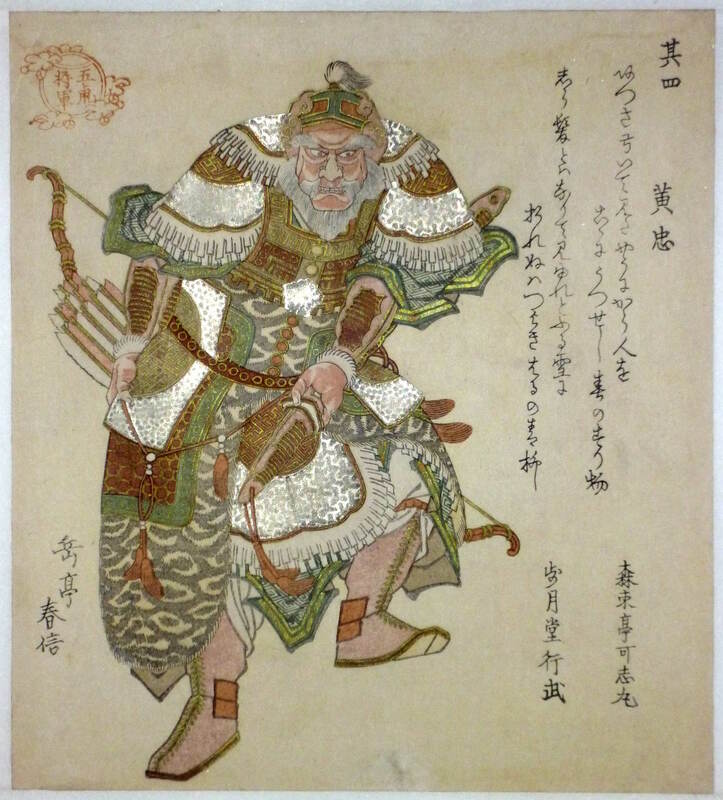 A surimono showing the Chinese warrior Ma Chao ( Jap: Ba Cho, 176-222 AD ). Best known for his role in the novel Tale of the Three Kingdoms. He is shown leaning on a giant axe. 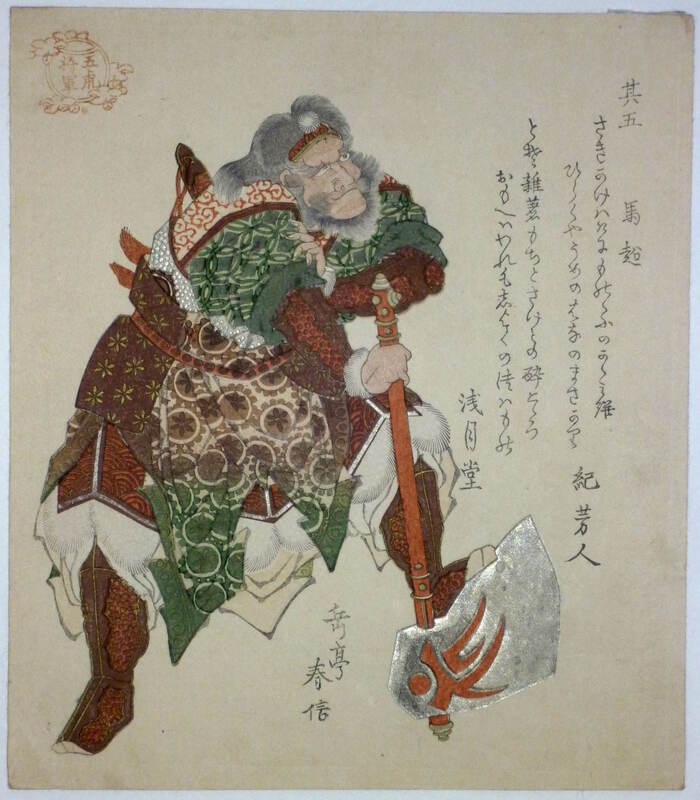 From a set Go koshogun, “The Five Tiger Generals.” Title on right Sono go Ba Cho, “Nr 5 Ma Chao. 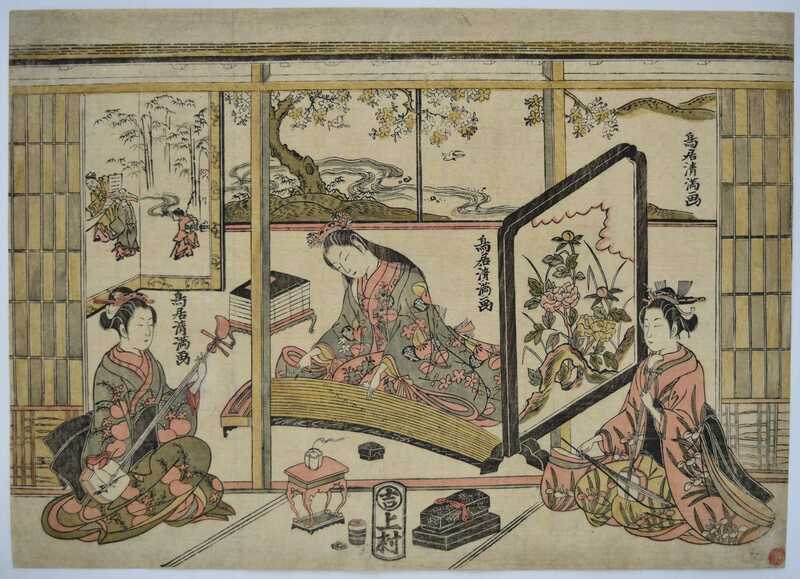 “ Issued by the Asakusagawa Poetry Club ( seal top left ) for the Tiger year 1818. Two poems by Ki no Yoshito ( right ) and Sengetsudo ( left ). 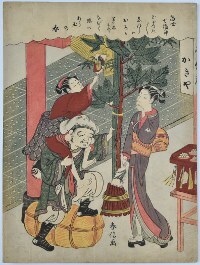 A rare chuban yoko-e surimono from a series Kinki shoga or the Four Accomplishments. 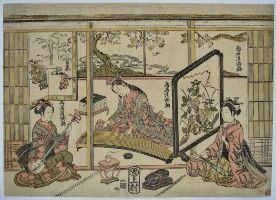 These pursuits were popular amongst Chinese and Japanese literati: Playing a musical instrument; playing go; calligraphy, and ( as here ) painting. 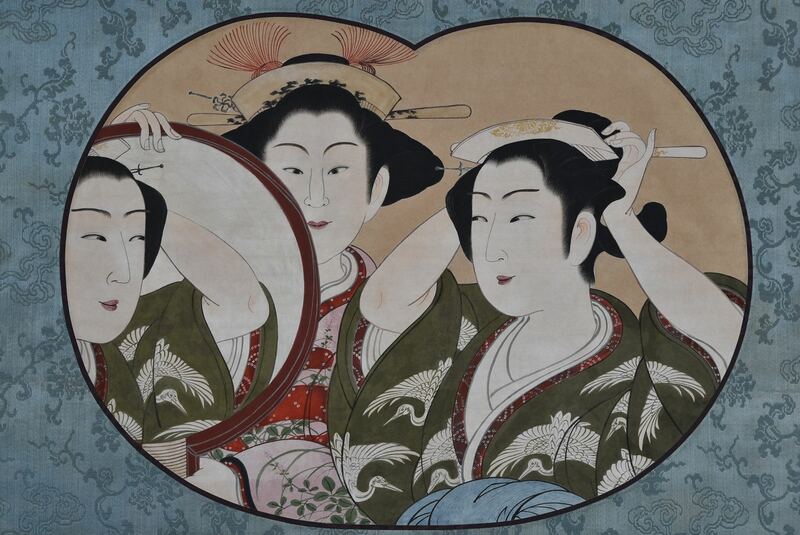 The composition shows a Heian courtier and two court ladies admiring a painting. 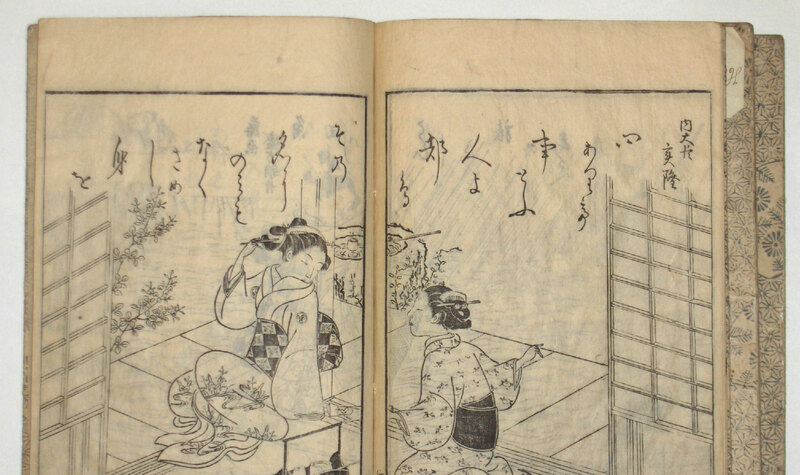 A poem by Mado no Muratake ( whose pupils probably commissioned this set ) gives his age as 74, and since he died in 1824 at 82, the surimono must have been issued in 1816. Fine impression and colour. Minimal edge soil, otherwise fine condition. 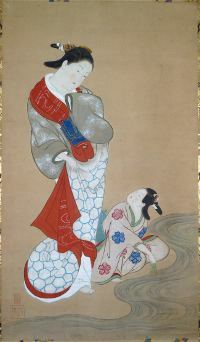 Signed Gakutei Harunobu. An exceptionally rare and very unusual koban surimono showing two onnagata actors. The only other recorded impression seems to be in Hokusai, Gian Carlo Calza, Electa, 1999, plate III.57. 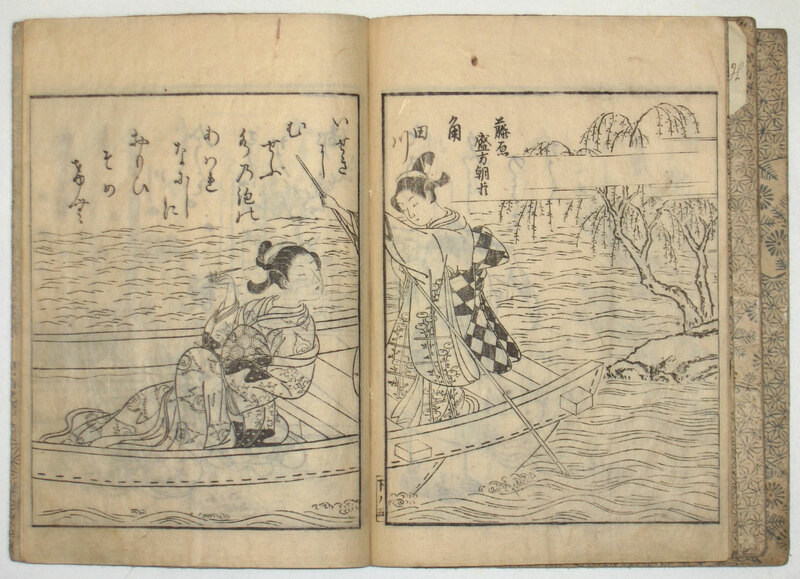 That has the months on the title slip of book for 1803 (and a poem top left). 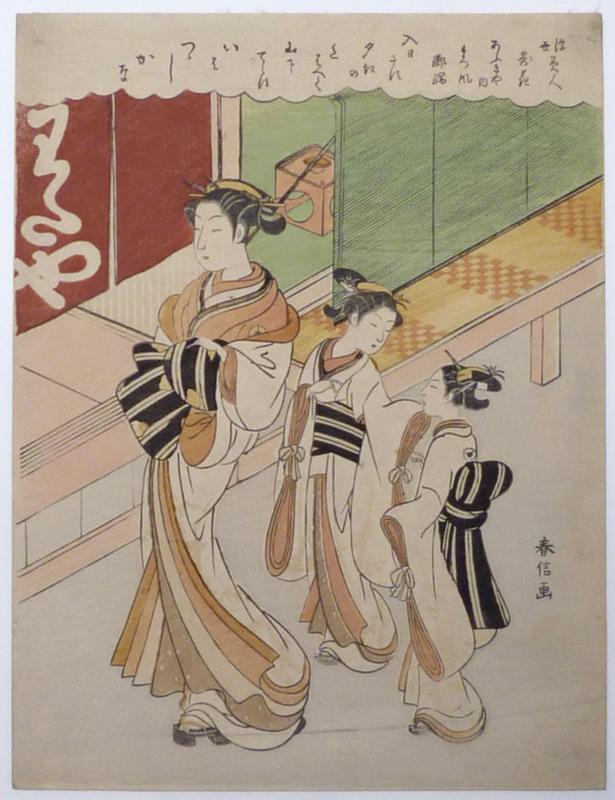 So this is an egoyomi and my impression must be either a proof or the first issue (same as Harunobu prints issued first without date, then with). 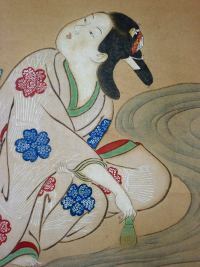 Very fine impression and colour. Signed Gakyojin Hokusai ga. 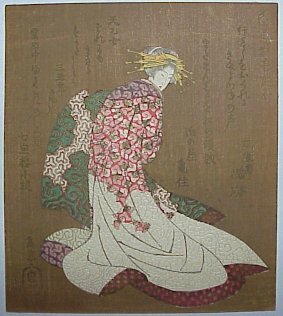 The actor Nakayama Bunshichi. . Kiyomitsu was the final flowering of the Torii School and a pioneer of the polychrome print. 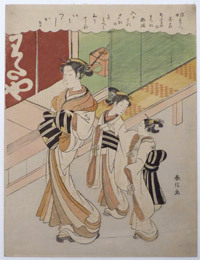 Harunobu went on to fully exploit the technique using a variety of unusual pigments and overprinting to produce a yet larger palette unsurpassed in the following years. 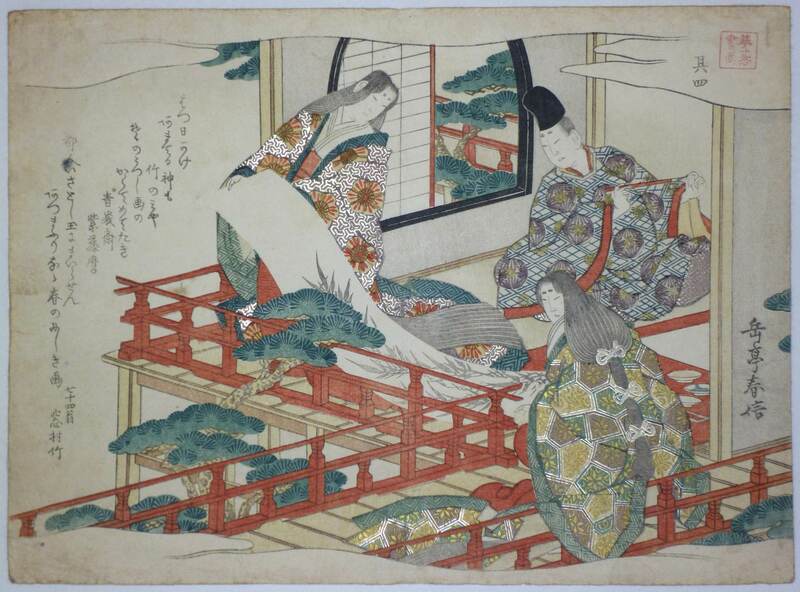 This print has all the hallmarks of a “proof” impression with best quality hosho and extra paper left and top. 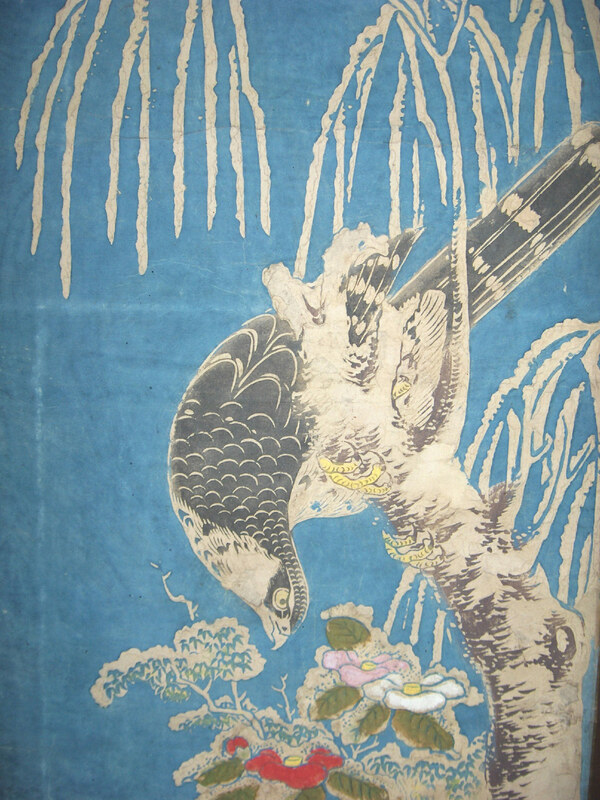 Printed in beni, yellow ochre, orange ( yellow over beni ), puce, light blue-grey and a grey ground. 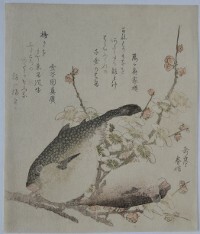 Published c 1768. Perfect preservation as the day it was printed. 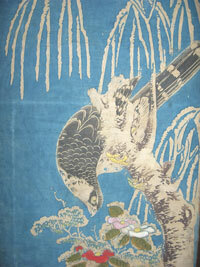 Superb impression, colour and condition. Immaculate keying of the blocks. Signed Torii Kiyomitsu ga.